Mini reviewThank you Text Publishing for sending me this copy. No compensation was given or taken to alter this review. On surface, The Accident may sound plain, mundane and even simple. However, underneath we come across layers of depth and fascinating writing skills that can really redeem this book to a great extent. A lovely debut, with a calculated structure and tone that’s soft yet eerie near the end, can really stick to readers for some time. After all, who knew that one car accident, just one could change, has changed and is changing everything completely. 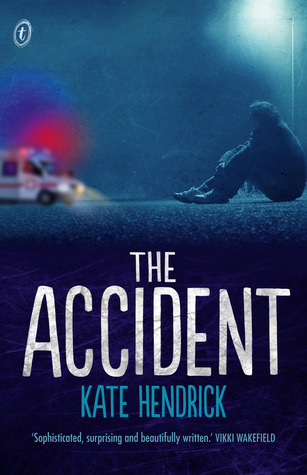 Written in the perspective of three exclusive teen voices, Hendrick unravels to what seems like a tragic accident into how it can alter people’s lives and decisions, or even how one perceives an issue. The Accident was a little mind-boggling to start with as the structure was very cryptic- yet I admired it in the end. So basically, we are set in time zones. Before, After and Later. One character for each time zone. And can I say, Hendrick utilised this structure advantageously and craftily. The characters were a little boring for my tastes but they did show some fine character development. We have Eliat in Before. She’s rebellious and messed-up, with a baby, Eliat’s trying to juggle looking after Tash, school and partying all at once. No one can really blame her for just wanting to drive aimlessly. A much more reserved female we have under Later is Sarah. New school, new surroundings and disarrayed family. What else could get worse? For me, Sarah was a little too sensitive but was much more relatable. And then we have Will, we follow him as After and his story. I didn’t really feel much emotion off Will but maybe that was the key- his minor withdrawal. However, what links these three characters cogently is that they are all lost. And this accident changed/is changing/ is about to change this. All in all, The Accident was a bland ride for me but had a lovely structure and simple idea which was executed quite well. This sounds really interesting. I like how it has three different people at three different times. It’s too bad that the characters were a bit flat, but I do like the idea of the book. Great review! It was a shame. I mean, the idea was freaking ingenious! The summary sounds so beautiful, and it’s sad to hear that the characterization failed to make much of an impact. hmm I like how you used the words cryptic and eerie to describe this one, that makes me think that I will like it! Seems like this one plays with your head a bit and I am always looking for reads like that! This is the first time I see this one around the chilling cover definitely has me intrigued. Aside from the bleh characters (not sure how I’d like Sarah seeing as I prefer my heroines to be tough and deal with life’s lemons if you know what I mean lol) it sounds right up my alley. The way it’s written with the time perspectives, if done well, can make a really fun read! Great review, chickie! Life’s lemons… LOL. Thanks, Giselle! Dude. Seriously. I cannot believe this is your mini review still, because it’s like the size of all of my normal reviews I feel so like vague now you cover everything so thoroughly omg >.< It's unfortunate, though, that the really boring characters kind of canceled out the unique use of POVs and all that in the story. I'm glad you still kind of enjoyed it, though! Fantastic review, Melanie! I just don’t like multiple POVs. I don’t even like dual, to be honest. But I do love that this story had unexpected depth and that the writing was so good. TOo bad the characters weren’t as interesting, but overall, it sounds like a pretty decent read. Lovely review as usual, Melanie! Thanks Maja. Multiple POVs confuse me at times.